The World Happiness Report measures "subjective well-being" - how happy the people are, and why. Western Europe and North America dominated the top of table, with the US and UK at 14th and 19th, respectively. Countries in sub-Saharan Africa and those hit by conflict have predictably low scores. Syria placed 152 of 155 countries - Yemen and South Sudan, which are facing impending famine, came in at 146 and 147. The World Happiness Report was released to coincide with the United Nations' International Day of Happiness on 20 March. It mainly relies on asking a simple, subjective question of more than 1,000 people every year in more than 150 countries. "Imagine a ladder, with steps numbered from 0 at the bottom to 10 at the top," the question asks. "The top of the ladder represents the best possible life for you and the bottom of the ladder represents the worst possible life for you. On which step of the ladder would you say you personally feel you stand at this time?" The average result is the country's score - ranging from Norway's 7.54 to the Central African Republic's 2.69. But the report also tries to analyse statistics to explain why one country is happier than another. 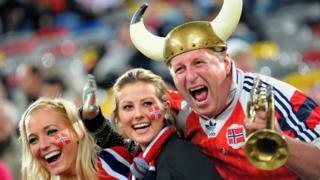 Can we all be as happy as Scandinavians? This year's report also contains a chapter titled "restoring American happiness", which examines why happiness levels in the United States are falling, despite constantly-increasing economic improvement. "The United States can and should raise happiness by addressing America's multi-faceted social crisis - rising inequality, corruption, isolation, and distrust - rather than focusing exclusively or even mainly on economic growth," the authors said. "America's crisis is, in short, a social crisis, not an economic crisis." Jeffrey Sachs, the director of the Sustainable Development Solutions Network, which published the report, said President Donald Trump's policies were likely to make things worse. "They are all aimed at increasing inequality - tax cuts at the top, throwing people off the healthcare rolls, cutting Meals on Wheels in order to raise military spending. I think everything that has been proposed goes in the wrong direction," he told Reuters. Why are the Danes so happy? The report also suggests that professional "white collar" jobs are associated with improved happiness over "blue collar" roles - but that having a job at all is one of the biggest factors. And while "those in well-paying jobs are happier and more satisfied with their lives", that effect has diminishing returns - "an extra $100 of salary is worth much more to someone at the lower end of the income distribution than someone already earning much more." The report has been published for the past five years, during which the Nordic countries have consistently dominated the top spots. The clear dominance of those countries - and Denmark in particular - has encouraged other nations to adopt the Danish concept of "Hygge" - a cultural concept of cosiness and relaxation.